Loving Yourself Before Loving Others. This is a question that has troubled many over the years, from scientists to people of the Arts. Trying to explain love has been a task that many have wanted to accomplish, everyone, coming up with a different answer. This is to be expected though because love occurs differently in everyone’s mind. So, this is our input on the meaning of love and what it means to love someone truly. Before you learn to love anybody else, you must first learn to love yourself. 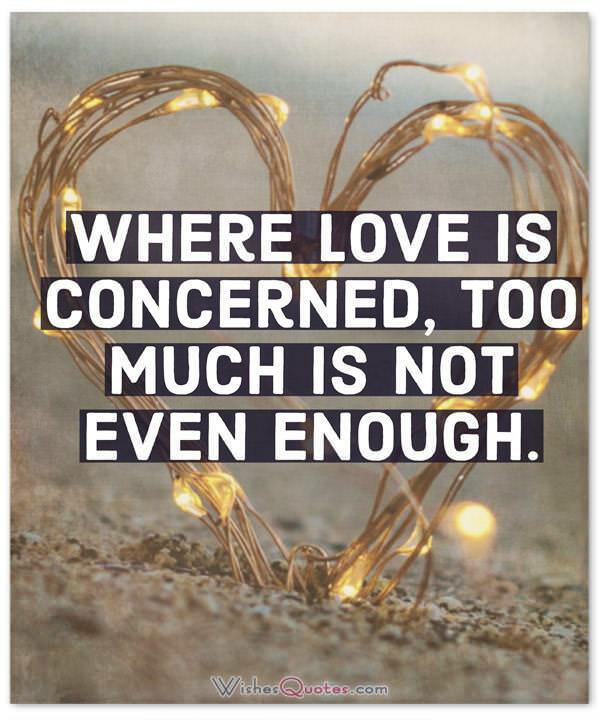 If you are not happy about who you are and are unconfident about you as a person, then it will show to the outside world, and you will start projecting it to your significant other, ultimately finding yourself unable to love them. Once you have learned to love yourself, it is crucial that you must understand that it is not always about you. Love is something that requires sacrifice from both participants to work. Otherwise, the one-sidedness will be intolerable. If you for-go your needs and start thinking about the best way to take care of your partner and they do it too, then a beautiful relationship will flourish. Negativity is the killer of all things marvelous. If you engulf yourself in the flame of your negative emotions, based on a slight defect from what you thought was perfect, then everything will be over before it even started. You see, if there is one thing required for you to love someone truly, is the faith that no matter what happens, everything will be alright. This is the key to an everlasting relationship because this will give you the courage required to work things out when they get rough. When you truly love someone, you have to give 150% for the relationship to work. In other words, you must commit. You cannot start going around doing the things that please you and not care about the other person. Otherwise, as we said before, the one-sidedness of the relationship will be intolerable. For a relationship to flourish, it is required that you are both committed to taking care of one another. A significant percentage of the relationships that do not succeed is not because of the things that truly happen, but because of the ones that we expected to happen and ended up not happening. It is our head that is the enemy of every relationship because when we start expecting things from others, and they end up not delivering, we start becoming delusional. This does not mean to tolerate everything and does not expect the basics of love, but you should not expect everyone to love you in the same way as you love them. This does not mean that they love you less, they just express it differently. Love generally is an emotion that comes from the heart, but for it to truly work, it needs the help of the brain in the form of dialogue. Let’s be real; problems will occur in every form of relationship. Nothing is perfect in this world, and we have to expect it. So, the best way to solve these types of problems and allow your love to keep growing is actually to talk about them. Don’t let the negative emotions grow inside of you, because when they burst it’s going to be a lot worse than it would be if you had briefly talked about them when they first started nurturing inside of you. You can’t expect to know everything about love from the get-go. It’s something that can never be conquered because, like the human brain, it is always expanding and always differs from one another. So, you must always be on the lookout for opportunities to learn something new every day that goes by, because it’s the small things that make a relationship between two people beautiful. It is better to try and do something about your loved one and ultimately failing, than never trying at all. Because trying, shows you care and failure gives you the tools never to fail again. So, combining this with what was previously said about the small things making all the difference, you should always try and do things for the one you love, even if they fail, just get a laugh out of it and try again. 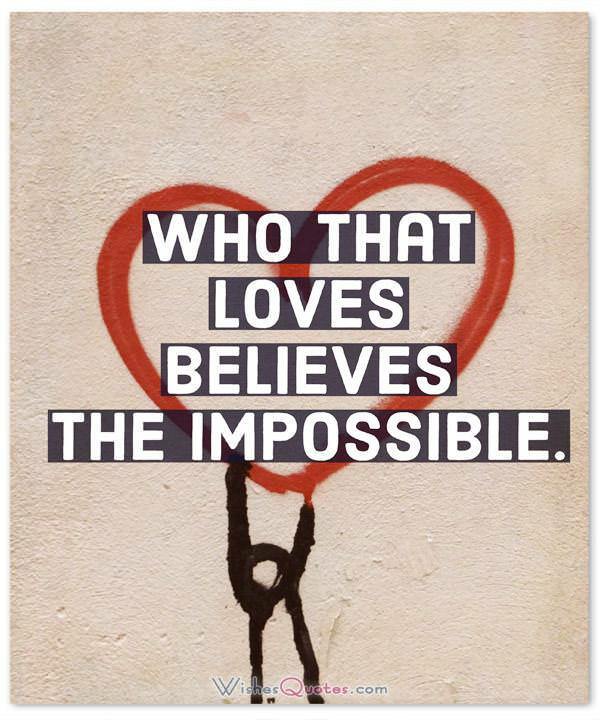 Who that loves believes the impossible. 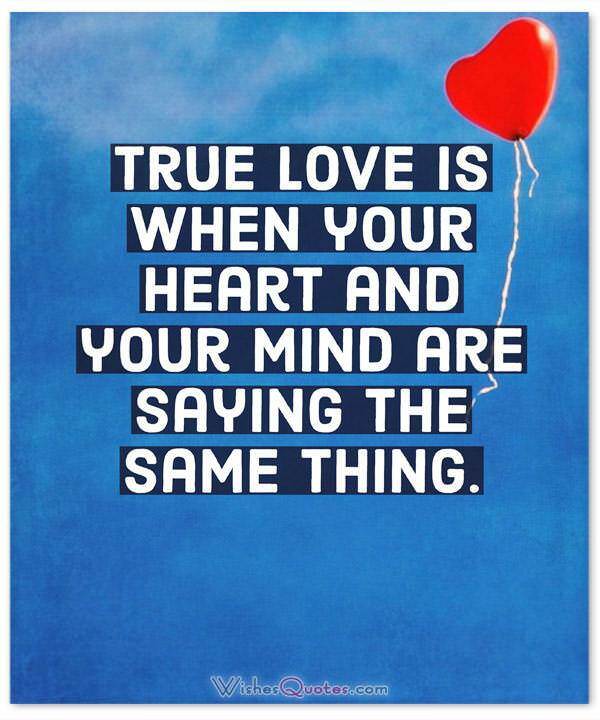 True love is when your heart and your mind are saying the same thing. 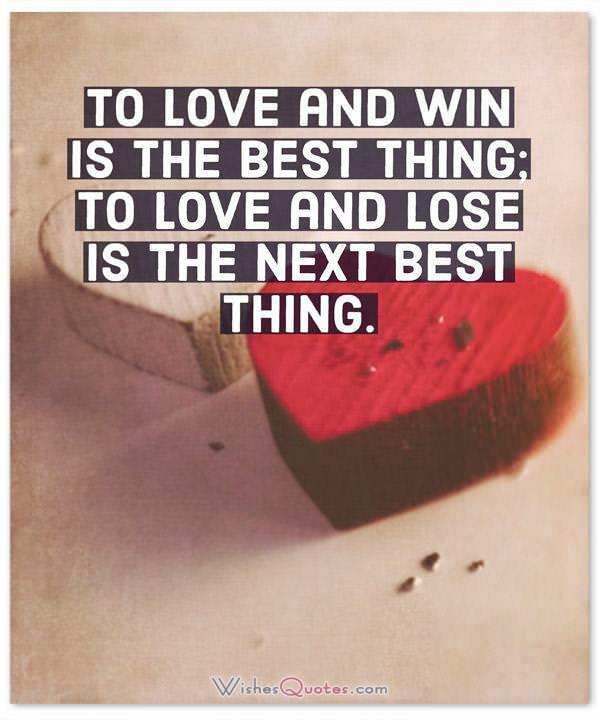 To love and win is the best thing; to love and lose is the next best thing. A man is already halfway in love with a woman who listens to him. A part of you has grown in me, together forever we shall be never apart, maybe in the distance, but not in heart. A poet without love is a physical and metaphysical impossibility. A self-centered man admitted: Sure, I know that the Bible says to love our neighbors as ourselves. But frankly, I don’t believe that my neighbors can stand all that affection. A woman who pretends to laugh at love is like a child who sings at night when he is afraid. Absence diminishes mediocre passions and increases great ones, as the wind blows out candles and fans fire. After observing the loved and the unloved, we found the loved ones rarely tried to manipulate others. At one time through love all things come together into one, at another time through strife’s hatred, they are borne each of them apart. Bitterness imprisons life; love releases it. Bitterness paralyzes life; love empowers it. Bitterness sours life; love heals it. Bitterness blinds life; love anoints its eye. But love is many things, none of them logical. Death is a challenge. It tells us not to waste time . . . It tells us to tell each other right now that we love each other. Find someone to love . . . And, oh, someone to love you. For two people to please one another, they must be very nearly alike, so that they may understand each other, and slightly different, so that they may have something to know in each other. He who remembers from day to day what he has yet to learn, and from month to month what he has learned already, may be said to have a love of learning. He who tries to forget a woman never loved her. How does one measure time? No, not in day, months, or years. It is measured by the most precious of all things: Love. Without which all beings and things whether brave and/or beautiful would perish. How satisfied would we be if we presented someone with vintage wine and, upon asking his opinion of it, he replied, I’m drinking it, aren’t I? I did not hear the words you said. Instead, I heard love. I do love I know not what; Sometimes this, and sometimes that. I like not only to be loved but also to be told that I am loved. I am not sure that you are of the same kind. But the realm of silence is large enough beyond the grave. This is the world of light and speech, and I shall take leave to tell you that you are very dear. I love everything old: old friends, old times, old manners, old books, old wine. I used to think that being nice to people and feeling nice was loving people. Now I know it isn’t. Love is the most immense unselfishness, and it is so big I’ve never touched it. I was nauseous and tingly all over. . . . I was either in love, or I had smallpox. If music is the food of love, then play on. If one judges love by the majority of its effects, it is more like hatred than like friendship. If people are allowed to love life, then they should also be allowed to hate it. If we deny the love that is given to us, if we refuse to give love because we fear pain or loss, then our lives will be empty, our loss greater. If you don’t like yourself, you can’t like other people. If you have respect and consideration for one another, you’ll make it. If you love someone, let them go. If they return to you, it was meant to be. If they don’t, their love was never yours, to begin with. Immature love says I love you because I need you. Mature love says I need you because I love you. 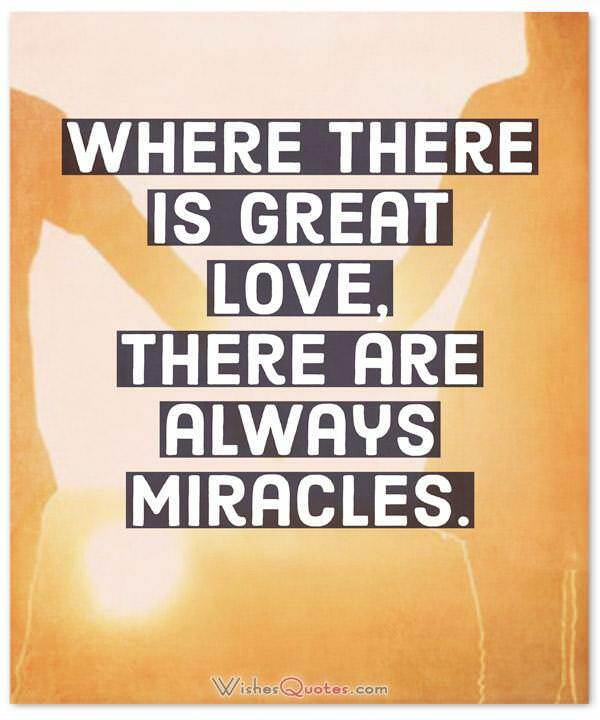 In real love, you want the other person’s good. In romantic love, you want the other person. It is a beautiful necessity of our nature to love something. It is by not always thinking of yourself if you can manage it, that you might somehow be happy. Until you make room in your life for someone as important to you as yourself, you will always be searching and lost. It is kindness in a person, not beauty that wins our love. It’s an extra dividend when you like the girl you’re in love with. It’s much easier to turn a friendship into love, than love into friendship. Learn to love good books. There are treasures in books that all the money in the world cannot buy, but the poorest laborer can have for nothing. Life is short, and we have never too much time for gladdening the hearts of those who are traveling the dark journey with us. Oh, be swift to love, make haste to be kind. Love and toothache have many cures, but none infallible, except possession and dispossession. Love can cure heartbreaks, misfortune, or tragedy. It is the eternal companion. Love does not just sit there, like a stone; it had to be made, like bread, remade all the time, made new. Love is a force more formidable than any other. It is invisible, it cannot be seen or measured, yet it is powerful enough to transform you in a moment, and offer you more joy than any material possession could. Love is acceptance. 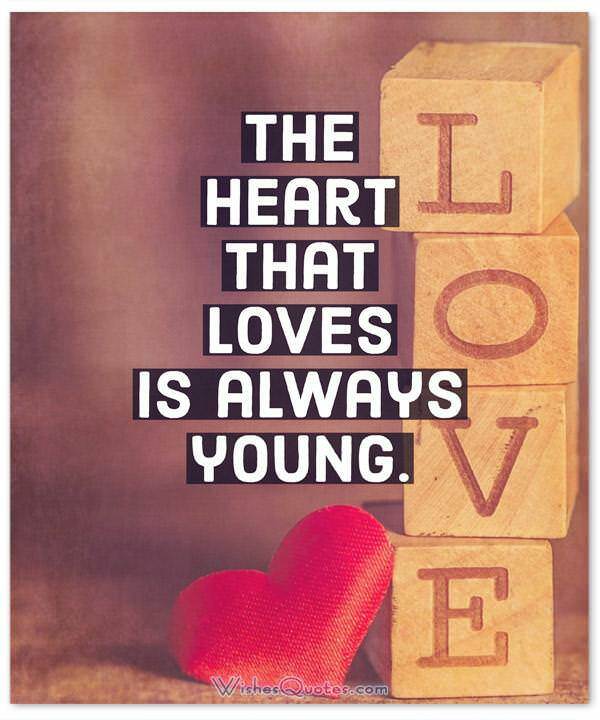 When you love someone . . . You take them into your heart, and that is undoubtedly why it hurts so much when we lose someone we love because we lose a part of ourselves. Love is as much of an object as an obsession, everybody wants it, everybody seeks it, but few ever achieve it, those who do will cherish it, be lost in it, and among all, never . . . Never forget it. Love is eternal as long as it lasts. Love is for fools wise enough to take a chance. Love is like the measles, all the worse when it comes late in life. Love is not blind, it sees more, not less; But because it sees more, it chooses to see less. Love is something eternal, the aspects may change, but not the essence. There is the same difference in a person before and after he is in love as there is in an unlighted lamp and one that is burning. The lamp was there, and it is a good lamp, but now it is shedding light, too, and that is its real function. Love is the most potent force the world possesses, and yet it is the humblest imaginable. Love is the only flower that grows and blossoms without the aid of seasons. 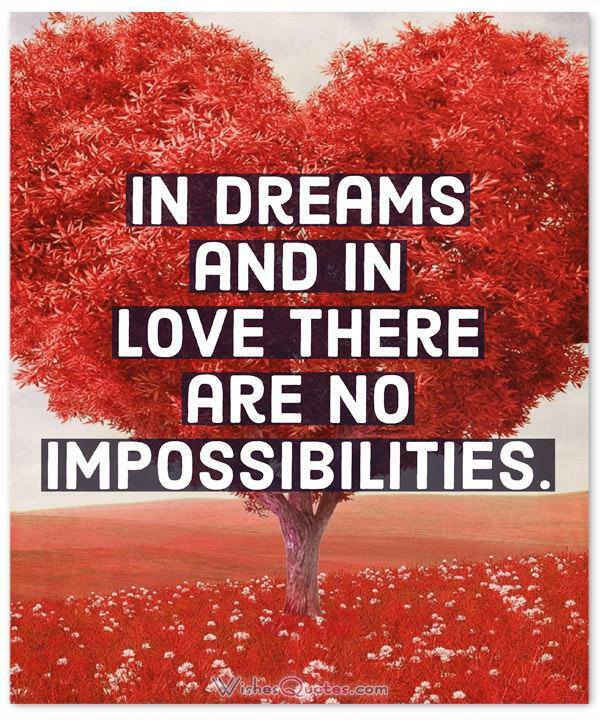 Love is what dreams are made of. Love is what is left in a relationship after all the selfishness has been removed. Love may conquer all, but it needs time as its field general. Love of country is like the love of a woman, he loves her best who seeks to bestow on her the highest good. Love still needs expression between those who share it. Love you know, seeks to make happy rather than to be happy. Love, at first sight, is one of the greatest labor-saving devices the world has ever seen. Love, such as in society, is only the exchange of two fantasies, and the contact of two bodies. Make love, not war; get married and do both! My father always told me, Find a job you love, and you’ll never have to work a day in your life. My life is an indivisible whole, and all my activities run into one another: and they have their rise in my insatiable love of mankind. My need is not to be on the outside glaring in; its to be in the center with you. To be loved is nice, but not essential. To love someone, that’s what makes life worth living. Never judge someone by who he’s in love with; judge him by his friends. People fall in love with the most appalling people. No man can sincerely try to help another without helping himself. No matter how love-sick a woman is, she shouldn’t take the first pill that comes along. No, this trick won’t work. . . . How on earth are you ever going to explain in terms of chemistry and physics so important a biological phenomenon as first love? Nobody can fully understand the meaning of love unless he’s owned a dog. He can show you more honest affection with a flick of his tail than a man can gather through a lifetime of handshakes. Nobody can fully understand the meaning of love until he’s owned a dog. He can show you more honest affection with a flick of his tail than a man can gather through a lifetime of handshakes. Of course, he replies. I’ve been married to you for twenty years, haven’t I? Pains of love are sweeter far than all other pleasures are. Remember that great love and great achievements involve high risk. Respect for sovereignty, for privacy, for total independence. Gentle alliances against loneliness, they were, cool, rational love-affairs without the love. Romance is about the little things. Sincere love is something that sacrifices not something that indulges itself. Sincere love is responsible. It would never knowingly hurt but would heal. Someone has written, Love is a verb. It requires doing not just saying and thinking. The test is in what one does, how one acts, for love is conveyed in word and deed. That is the true season of love when we believe that we alone can love, that no one could ever have loved so before us and that no one will love in the same way as us. The best and most beautiful things in the world can not be seen or ever touched, they must be felt with the heart. We should do everything within reason to save a good relationship. But if we are constantly trying to save it, it’s probably not a good relationship. The best smell is bread; the best saver, salt; the best love, that of children. The greatest happiness of life it the conviction that we are loved, loved for ourselves, or rather, loved in spite of ourselves. The love of study, a passion which derives fresh vigor from enjoyment, supplies each day and hour with a perpetual source of independent and rational pleasure. The money will buy you a fine dog, but only love can make it wag its tail. The more I think about it, the more I realize there is nothing more artistic to love others. The true revolutionary is guided by a great feeling of love. The truth is that there is only one terminal dignity, love. And the story of a love is not important, what is important is that one is capable of love. The value of compassion cannot be overemphasized. Anyone can criticize. It takes a true believer to be compassionate. No greater burden can be born by an individual than to know no one cares or understands. The way to love anything is to realize it might be lost. There are two sorts of constancy in love one arises from continually discovering in the loved person new subjects for love, the other arises from our making a merit of being constant. There is a lady sweet and kind, Was never face so pleased my mind; I did but saw her passing by, And yet I love her till I die. There is a passion of reverence, almost of pity, mingling with the love of an honest man for a pure girl, which makes it the most exquisite, perhaps, of all human sentiments. There is no disguise which can hide love for long where it exists or simulate it where it does not. There is only one sort of love, but there are a thousand copies. To be loved is to live forever in someone’s heart. To learn and never be filled, is wisdom; To teach and never be weary is love. To live is like love, all reason is against it, and all healthy instinct for it. To love is to transform; to be a poet. To understand your parents, love you must raise children yourself. 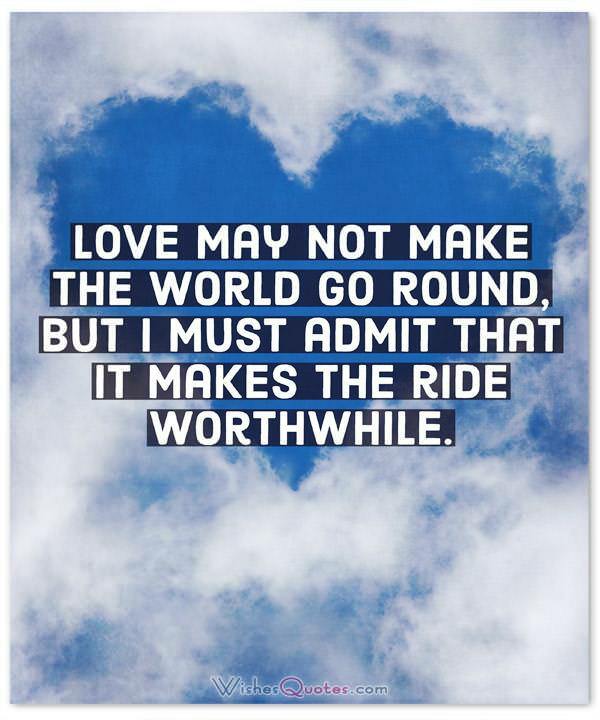 True love is the outward demonstration of inward conviction. We are all born for love. . . . It is the principle of existence and its only end. We can do no great thing, only small things, with great love. We must love one another. Only [by doing] so can our long years of toil and struggle reach full reward, and we are crowned with life everlasting. What force is more potent than love. When one has once fully entered the realm of love, the world no matter how imperfect becomes rich and beautiful, it consists solely of opportunities for love. When the one man loves the one woman, and the one woman loves the one man, the very angels leave heaven and come and sit in that house and sing for joy. When you find a job you love, you’ll never have to work a day in your life. When you love somebody, you should follow your heart. Sometimes when you are with the person you love the most, you feel confused. You don’t know who you are or what you want, but that is totally understandable. It is natural to let go of a part of yourself to be with that person, but the important part is that you don’t lose your own identity in the process! Whenever you have truth, it must be given with love, or the message and the messenger will be rejected. Where we love is truly home; home that our feet may leave, but not our hearts. Without love intelligence is dangerous; without intelligence love is not enough. 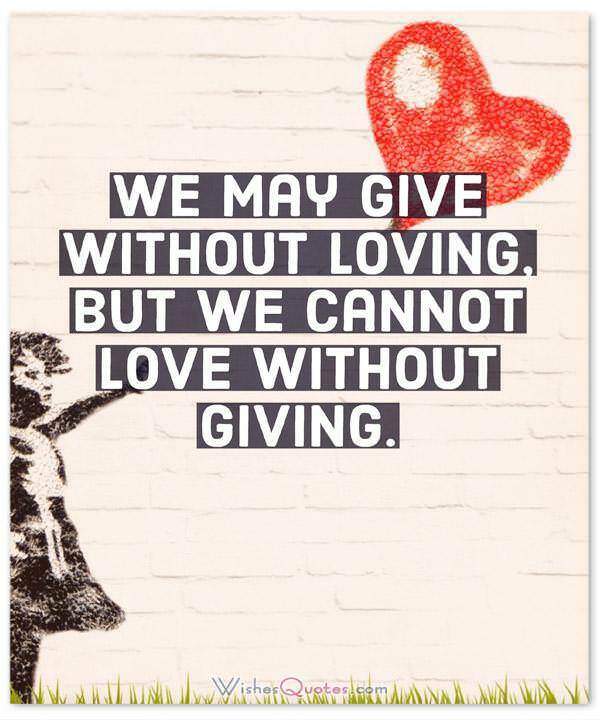 Without loving acts, loving words are meaningless. You don’t pick who you fall in love with. There are so few people to love. It’s hard for one adult even to like another. Almost impossible. You have to walk carefully at the beginning of love; the running across fields into your lover’s arms can only come later when you’re sure they won’t laugh if you trip. You needn’t love your enemy, but if you refrain from telling lies about him, you are doing well enough. You will find as you look back upon your life that the moments when you have really lived are the moments when you have done things in a spirit of love. Your love shines in my heart as the sun that shines upon the earth. You’ve got to dance like no one’s watching and love like it’s never going to hurt.